THIS IS A VERY WELL MADE PRODUCT AND EASY TO OPERATE AND MOUNTS QUICK AND EASY AND IS LIGHTWEIGT FOR THE STRENTH OF THE PRODUCT.I WOULD HIGHLY RECOMEND! I took a chance knowing that it was an offbrand and I regret it. It all seems fairly well built except for the locking mechanism for the rail. It’s cumbersome and keeps un threading itself. I would deathly recommend spending the money on the bed or Bipod. Do not pay more for a bipod. This has all the features and quality of bloods that are 4 or 5 times the price. I love the Quality for the price! Would buy again. 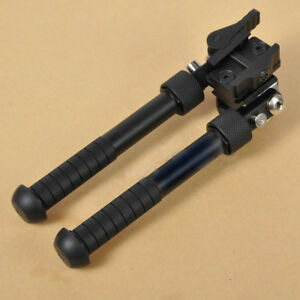 Great bipod, easy to install, very steady yet very flexible .